One item that needed to be completed before the side skins go on is finishing the fuel line connection under the fuel tank. Decided it would be best to do this now while access is still good. 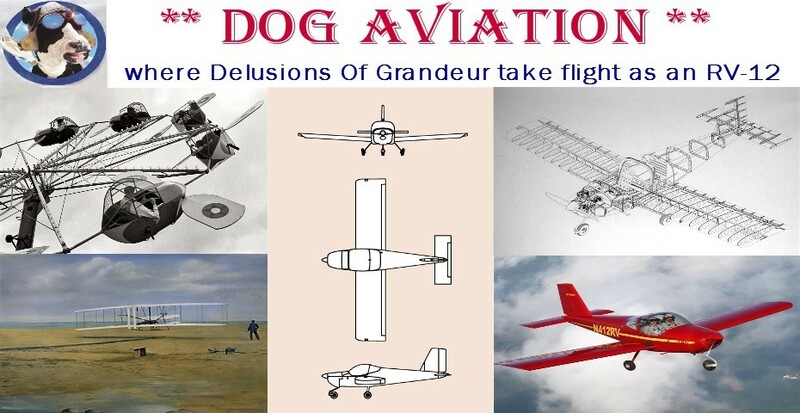 Frequent followers of the Blog may recall the DOG Aviation RV-12 will be receiving a small modification to the fuel line just below the fuel tank that was designed by another builder. The modification will add a fuel drain valve directly below the fuel tank for use as a fuel testing and drain point. When working on section 28 of the plans, the 3/8” fuel line running from the fuel tank to the fuel pump was not bent upward to meet the fitting on the bottom of the fuel tank. At that time, the finishing kit was not purchased … so the fuel tank parts were not available for making precise measurements to cut the fuel line to proper length. So rounded up the bottom of the fuel tank and the fittings that will be used for the modification. The modification will consist of a 1 3/4" piece of tubing (flair to flair) that attaches to the fuel fitting on the bottom of the tank. Below that will be a tee that will connect to the fuel line going to the fuel pump. The lower portion of the tee is where the fuel drain valve will be installed. Photo shows the bottom of the fuel tank in position and the blue Tee can be seen (not very well) by looking through the far left lightening hole. The partially completed fuel line assembly was connected onto the fuel pump along with the return fuel line so a measurement could be taken on exactly where to cut the fuel line at the tee fitting. After the measurement was taken, the 3/8" fuel line was cut and the end flared. The AN826-6D tee has pipe threads on the bottom and the center and top utilize flair fittings. Instead of the fuel line curving upward and attaching onto the bottom of the tank (as the partially visible fuel return line on the left in the photo below does), the modification uses an AN826-6D tee that the fuel line going to the fuel pump attaches onto. The tee is attached onto a short piece of fuel line that measures 1 3/4" flair to flair. Completed fuel line connected onto the AN826-6D tee. After the fuel tank is built and installed, the photo below shows the remaining parts that will be installed onto the bottom of the AN826-6D tee during final assembly to complete the fuel drain valve modification. 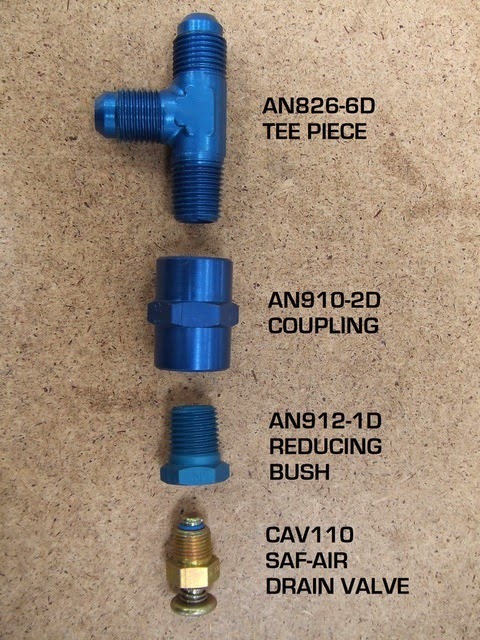 Parts that will connect onto the bottom of the AN826-6D tee to complete the fuel drain valve assembly.